Empirical studies of material artifacts in practice continue to be a rich source of theoretical concepts for CSCW. This paper explores the foundational concept of boundary objects and questions the conception that all objects that move between communities of practice are boundary objects. This research presents the results of a year-long ethnographic study of collaborative work, specifically the multidisciplinary collaborative design of a museum exhibition. I suggest that artifacts can serve to establish and destabilize protocols themselves and that artifacts can be used to push boundaries rather than merely sailing across them. Artifacts used for collaboration do not necessarily exist within a web of standardized processes and disorderly processes should not be treated as “special cases”. 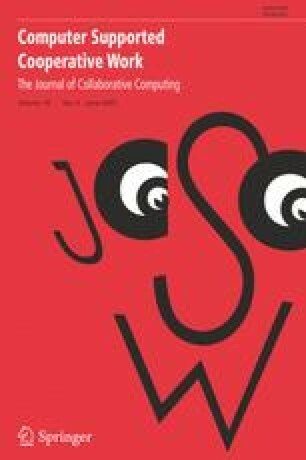 An earlier draft of the work was published in the Proceedings of the 9th European Conference on Computer Supported Cooperative Work (ECSCW 2005). Several pages longer, this work adds substantial clarification of the theoretical critique and also includes photographs of actual case study artifacts. This work has benefited from the assistance of Leah Lievrouw, Jonathan Furner, Jennifer A. Rode, the reviewers of this manuscript, and especially Phil Agre and Paul Dourish. This work has been funded in part by NIH grant #5M01RR000827 and a postdoctoral fellowship from the California Institute for Telecommunications and Information Technology (Calit2) at UC Irvine.